While it can be relaxing and fun to talk to your friends about your relationship, some things should never leave the confines of your bedroom and your home. Being in a committed relationship is all about trusting the person you’re with and keeping relationship secrets, a secret. Once trust is broken, it’s very difficult to gain it back – so ideally, you never want to find yourself in that unpleasant situation. Why do we have the impulse to tell our friends the dirty details of our relationships? There are different reasons – sometimes it’s to brag and sometimes it’s to vent. But other times, we don’t know what relationship secrets are appropriate to share and which ones are not. Airing your relationship’s dirty laundry in the open can lead to broken hearts and an irreparable loss of trust. 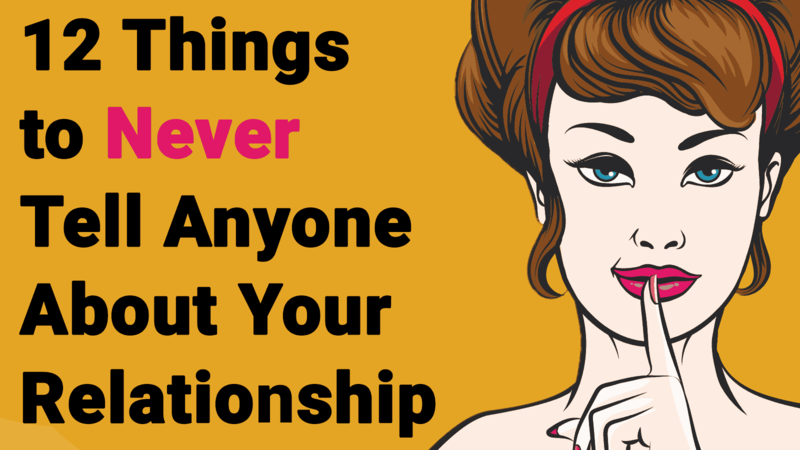 Take a look at this handy go-to list about a few things to never tell others about your relationship. Whether you’re doing well or doing horribly, it’s none of your friends’ business what your partner earns or how you pay the bills every month. Money is a very touchy subject in society these days, so you want to make sure you’re staying on the right side of those conversations. To be honest, that’s one of the few things on this list that you’re more likely to get asked than to volunteer yourself. In short, it’s none of your friends’ business, and it should stay that way. It’s in our nature as human beings that we simply can’t get along with everyone. If your partner tells you that they don’t like someone from your inner circle, they’re sharing that with you in confidence. Spreading such information around causes tension on both sides of your relationship. In the worst cases, you might be forced to choose between your friendship circle and your significant other. Spare yourself the trouble and keep your partner’s opinions to yourself. This is one of the things to never tell about a relationship. Picking gifts for people – even if it’s someone you know really well – is a talent that not everyone has. If your significant other has given you socks that don’t fit you or a piece of jewelry that you absolutely hate but still resign yourself to wearing for anniversaries, don’t tell others. It’ll just make them look stupid. Also, if word gets back to them, they’ll feel even worse knowing that you hated your present so much you had to tell your friends. It’s always unpleasant to fight with your significant other, so why relive the fight by talking about it with someone else? Not only is it, in a way, airing your dirty laundry, but it’s also a sign that you probably haven’t gotten over that fight yet. Let it go and get over it, and if you need to talk to anyone about it – talk to your partner. What happens in the bedroom stays in the bedroom and that’s how it needs to be. Even if you’re having problems, there’s no way to stay positive about solving them if you keep thinking about them. Besides, think of the way your friends will start seeing your significant other after you tell them something so private. These relationship secrets should be kept private. Give your partner some dignity and save your intimacy to yourself. When saying something negative, always think about how those words might come back and bite you. Some people aren’t lucky enough to have in-laws. Sure, you’re under no obligation to like them, but if you have a problem, talk to them, and not behind their back. Besides, if your significant other hears your gripes, it will only cause resentment and hurt feelings. This one should be obvious – relationship secrets are, after all, meant to stay between two people. But not everyone is that cautious about betraying confidentiality. You’d be surprised just how many people feel the need to betray someone’s deepest secret. Whether it’s a family secret or something insignificant, the fact they’ve trusted you with it is substantial – don’t waste it. Everyone has them, but not everyone wants them to be revealed. Your partner feels like they can be themselves around you and that’s a rare gift. If you say that they’re really insecure about something, it’ll attack their confidence because they’ll think you see it as a flaw. Don’t betray them like that. Again, this is all about the other person being comfortable and happy around you – enough to truly be themselves. If they like to sleep with stuffed animals, so what? It’s their life and their choice. But it’s not information they’ve volunteered to be public and there’s probably a good reason for that. That’s one that others will definitely try and make their business. If one of you cheated but you’re trying to move past it together, keep this to yourselves. You might have enough love and forgiveness to forgive and forget, but your friends will likely never move past it. They’ll be that nagging voice in your head, personified. You definitely don’t need that in an already complex and difficult circumstance. This is one of the things to never tell about a relationship. If your partner wanted to text your best friend, chances are they would. Even if it seems insignificant, your texts are private correspondence and they should stay private. Besides, it makes you look cheap in front of your friends – like you’re showing off with your relationship. Let bygones be bygones and stop talking about their ex-partners with your friends. Your partner is with you now and that’s what matters. Your friends and family will over-analyze why their last relationship failed and it’ll only make you more anxious. The key is to keep up the positive thinking and remember that now you are together. Airing your dirty laundry in public is a big no-no in relationships – but as long as you follow those simple rules of trust, you can be sure that your partnership will be strong and stable for many years to come!